How to Restore Lost iPhone Photos after iOS 12 Update? How to Restore Lost Photos on iPhone after iOS 12 Update? "Has anyone lost photos on iPhone after iOS 12 update? I feel sick! I'm missing over 25,000 photos ?????? All the photos of my children are on iPhone/iCloud!" Lost photos problem has been a universal flaw of iOS update back to iOS 11/10/9 and earlier, so photos disappeared from iPhone after iOS 12 update should never be news. Now that you have encountered lost photos on iPhone after iOS 12 update issue, instead of complaining, finding the solution is your priority surely to get back the missing photos as many as possible. The best way to keep your iPhone photos safe is surely to give it a backup, no matter you want to update to iOS 12 or just replace your device with a new one, say iPhone XS, XS Max or XR. DearMob iPhone Manager is therefore a good choice for you to backup and restore iPhone photos for iOS 12 update, and manage, transfer or edit iPhone photos, music, videos, contacts, etc at will. To solve lost photos after iOS 12 update problem, there are two methods you can refer to. One is to backup iPhone photos in advance to forestall the photo missing, and the other is to recover lost photos after iOS 12 update through a tool. Whichever way you choose, you can find the specific guide here to help you solve "pictures are gone after iOS 12 update" issue quickly and easily. How to Solve Lost iPhone Photos after iOS 12 Update? Instead of finding a remedy to recover the missing photos after iOS 12 update, we are more likely to recommend you to backup iPhone photos first before upgrading to iOS 12 to keep them safe ahead of time. Here, we introduce 3 ways that you can try to backup iPhone photos for restore in case that your photos disappeared from iPhone after upgrading to iOS 12. Step 2. USB-connect your iPhone to computer, once there is a popping up message on your iPhone handset, tap "Trust This Computer" to continue. Step 3. 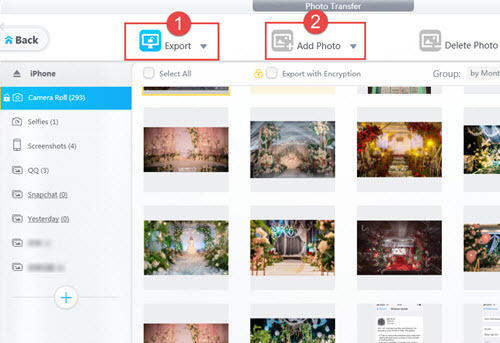 Click on Photo Transfer, choose the photos you want to backup and then click "Export" to transfer iPhone photos to computer. Notice: DearMob iPhone Manager also allows you to encrypt the iPhone photos to protect anything private or sensitive. To enable this, just check Export with Encryption and follow the guide to password lock your photos. If you have photos disappeared from iPhone after iOS 12 update, you can just transfer back photos to iPhone from computer by clicking on the "+ Add Photo". Besides lost photos after iOS 12 update issue, you may also find losing messages or disappearing contacts. So, backup the whole iPhone is really recommended to avoid precious data loss. 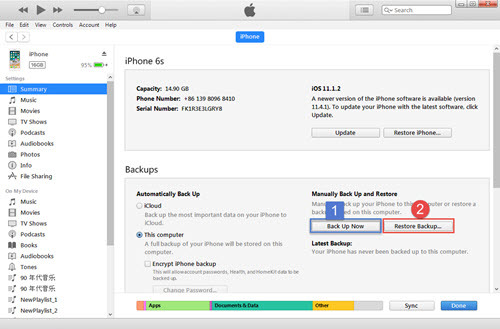 DearMob iPhone Manager Backup function can allow you to backup iPhone data files in batch and restore in a click, and also encrypt the iPhone backup in a password-protected way. 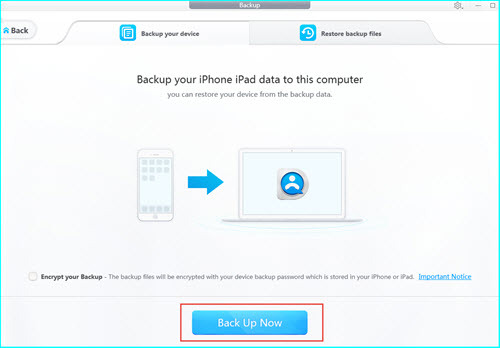 When your iPhone is connected to computer, click Backup icon on DearMob iPhone Manager and click on "Back Up Now" button. Then, this iPhone back software will automatically backup your iPhone. The backup time is based on the file size on your iPhone, so please be patient and do not plug out your iPhone during backup. Just switch to the "Restore backup files" window, choose the backup file you want to restore and then click on Restore Now. DearMob iPhone Manager will restore all iPhone data files including photos to your iOS 12 iPhone. iTunes is the native method that Apple introduces for people to sync media data and backup iPhone files. If you are more familiar with iTunes, it is a good choice for you to backup and restore iPhone photos for iOS 12. Launch iTunes and connect your iPhone to computer via USB > click on the phone-shaped icon in the left menu bar > click on Back Up Now to backup your iPhone. * Photos already stored in the cloud, like My Photo Stream and iCloud Photo Library can't be backed up. After iOS 12 update of your iPhone, you can connect your iPhone to iTunes to recover the losing photos from the iTunes backup. Just click Restore Backup button, select one backup containing the photos you want to restore and click Restore. Go to Settings > Your name > iCloud > Photos > Make sure that you have turn on iCloud Photo Library and Upload to My Photo Stream to automatically upload and store your iPhone photos in iCloud. Notice: There is only 5GB storage space in iCloud for you to backup iPhone photos without cost, if you have gigabytes of iPhone photos, you need to pay some money to upgrade your iCloud plan for more space. 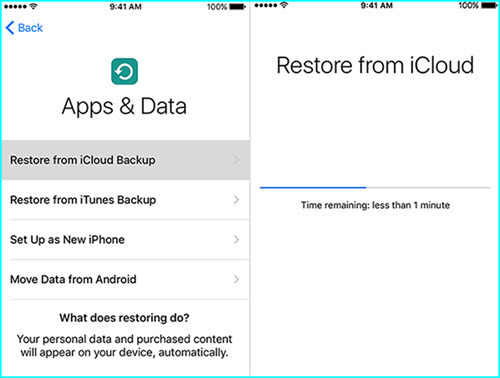 Besides, restore form iCloud backup needs strong and stable WiFi network for full download photos to your iPhone. Turn on your iPhone > Settings > General > Reset > Tap Erase all content and settings option > Reach the Apps & Data screen > Tap Restore from iCloud Backup > Sign into iCloud > Choose backup > Select the iCloud backup that contains the photos you want to restore. If you have forgotten to backup iPhone photos ahead of time, do not worry about the pictures gone after iOS 12 update, there are various recovery tools that can help get the lost iPhone photos back. To name a few, iMobie PhoneRescue, EaseUS MobiSaver and iMyFone D-Back are popular ones that help people recover lost photos after iOS 12 update easily. However, once your iPhone photos got lost, you can't do any operation on your iPhone, otherwise the missing photos will be overwritten by new-generated data. Under such condition, no tools can help recover the photos disappeared from iPhone after iOS 12 update, and that's why we recommend you to backup iPhone photos via DearMob iPhone Manager, iTunes or iCloud first before upgrading to iOS 12.